For countries that don’t have the money to invest in new energy resources, the future looks bleak. In a special report released last week, the Paris-based agency said that meeting the world’s growing need for energy will require at least $2.8 trillion in annual global spending. To put that amount in perspective, that’s equal to the total annual Gross Domestic Product (GDP) of South Korea, Saudi Arabia, Switzerland and Austria combined. That’s 50% more than the world spends now on energy. Much of that spending, according to the IEA, won’t even add a single kilowatt, therm or BTU to the world’s energy supply. Of course, spending $20+ trillion just to maintain current production means that energy costs will have to rise. While renewable sources, such as solar, wind and geothermal power, show promise, the truth is none of them are currently cost competitive. In fact, the techniques necessary to find and extract oil and gas, such as hydraulic fracturing (fracking) and deepwater drilling are significantly more expensive than traditional oil and gas wells. Processing can cost more as well. Mostly from consumers, especially from consumers in the countries that use and demand the most energy. And since, according to the U.S. Energy Information Administration, the U.S. accounts for nearly 19% of the world’s primary energy consumption, that makes U.S. consumers one of the leading revenue sources. And there’s another factor to consider: As energy resources become more risky to develop, and political and regulatory actions add even more uncertainty, private investment has become more difficult. Increasingly, governments in North America, South America, Europe and Asia are playing a much greater role in energy development and infrastructure. That, of course, means taxpayers, either directly or indirectly, are footing more of the bill, especially when it comes energy efficiency. 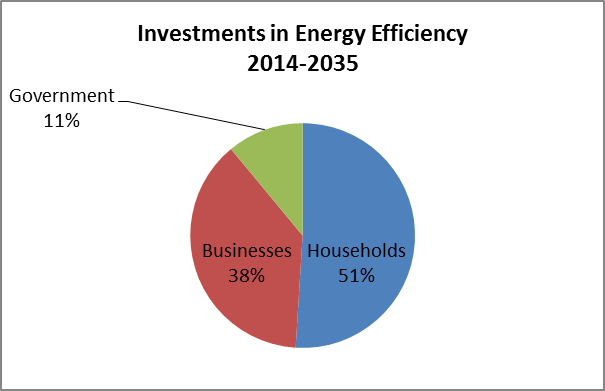 According to the IEA, households will be on the hook for more than half of all spending to improve energy efficiency over the next 20 years. In 2013, that figure topped $130 billion or roughly 10% of all energy spending. Europe faces an even bigger problem. Its current energy generating capacity falls well short of future needs, but current market rules make developing new energy sources economically unfeasible. Put simply, Europe needs to invest $2.2 trillion – the 2nd largest amount after China – to replace its aging infrastructure, and the money just isn’t there. The problem is that with current market rules, wholesale power prices are 20% below what it costs to generate. Either the Europeans have to figure out a way to find, extract, process and transmit energy for 20% less – virtually impossible – or European consumers will have to pay more. Much more. But there is one bright spot in the report: It’s liquefied natural gas or LNG. That’s a stunning reversal from just seven years ago, when everyone agreed the U.S. would be using LNG imports to meet 15% of its gas needs by 2020. But thanks to the unconventional shale boom, now even the most conservative Russian estimates acknowledge that the U.S. could be providing between 6% and 8% of all LNG exports worldwide by 2020. In fact, U.S. companies involved with LNG exports are now set to hand investors one of the best investment opportunities of the decade, led by Cheniere Energy Inc. (NYSE:LNG) – Kent’s favorite ways to play this brewing boom. Here’s why: Cheniere has already garnered no fewer than five huge multi-billion dollar 20-year contracts with some of the largest European and Asian importers in the world and is just warming up. In fact, Cheniere has been one of Kent’s “core holdings’ since late 2012, handing Energy Advantage subscribers gains as high a 270%. And here’s the thing: the first LNG exports won’t even leave their facilities until late this year at the earliest. So while the American consumer will wind up paying much more for energy in the future, it’s not all bad news – especially if you understand the best way to play it. One thing often ignored is that the US has a lot of energy locked up by the government – like ANWR Alaska and a lot of offshore deposits. Opening these will help. Also, the new idiotic restrictions on coal plants should be stopped. Also, in my opinion, a lot of power plants could probably stay open longer than they’re saying. I think some government regulations may be saying they need to close at some particular age, but they probably are really good for longer.